Happy New Year! Though today is gray and rainy, our new year started out as bright, sunny, and 49 degrees…not too shabby for January in Delaware! After a year off dealing with some health issues, I’m back in the swing of things and was ready to be out and about exploring the local wonders yesterday. A trip to my neighborhood park did not disappoint…deer sign, chickweed, warm sunshine, and a serenade by crows, chickadees, and cardinals. One of my favorite trees is the Sycamore (Platanus occidentalis), with its peeling bark that leaves white streaks, making it recognizable in any season and earning it the nickname of “Ghost Tree”. Sycamores like to stretch out their branches and are harbingers of nearby water. This beautiful specimen overlooks the White Clay Creek that runs through my neighborhood. I also found some green herbaceous plants, which tells me that these are non-native species. We don’t have too many native plants that are green during the winter here. Poison hemlock (Conium maculatum) and stinging nettles (Urtica dioica) were enjoying the sunshine and growing in areas protected from the wind. As I neared the end of my walk, I found a bench to bask in the sun for a bit, when I heard a rhythmic knocking in a grove of trees behind me. I looked around, but couldn’t see the noisemaker from where I was sitting, so I got up and gingerly moved as quietly as I could until I spotted her. And somewhere nearby, her larger kin has been hard at work. Here’s hoping 2017 will be filled with bright and beautiful treasures to fill our hearts with joy! Confessions from the yard: I found it difficult to work outside and then manage the time to come inside and blog about it. So, here’s my summary of the second half of the year, filled with pictures of the growing season. This has been a steep learning curve in many ways – most significantly, to simplify. Win! Cinder blocks served as great boundaries. The marigolds planted in the holes were lovely and tenacious guardians till late in the fall, and overall, the veggies were abundant. 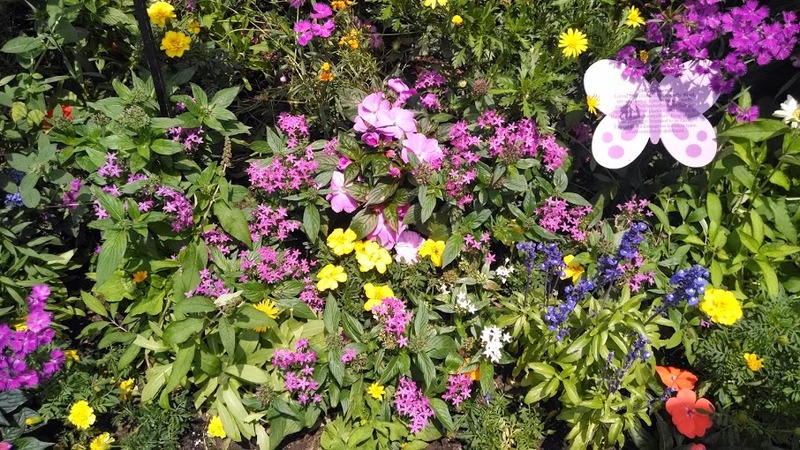 The beds really became a hearty ecosystem, with insect eggs on the leaves, worms and other invertebrates in the soil, and pollinators and butterflies visiting the flowers. Such a beautiful sight all season long! After overhauling the kale bed, I added some medicinal herbs: parsley, calendula, stevia, self-heal, and spilanthes. I think it was too hot for the calendula and not moist enough for the self-heal, but the parsley, stevia, and spilanthes thrived! There was an unintended addition – evening primrose was apparently in the same pot as the self-heal. It grew tall and proud and flowered long into November. 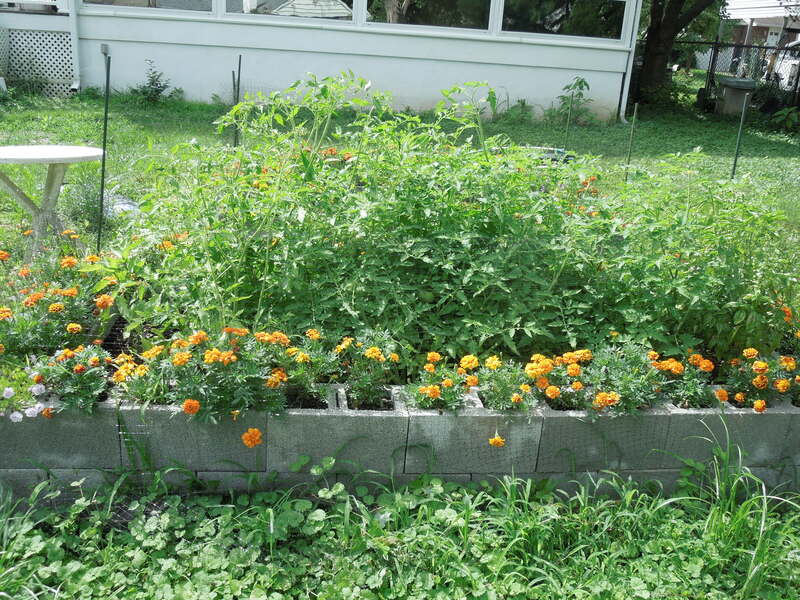 Oops…Too many tomato plants. They didn’t look like they were even going to survive when I transplanted them, but every single one did. They went crazy while I was on vacation and didn’t get thinned. We did have a pretty good harvest though, with the cherry tomatoes being the most healthy and prolific. Fothergilla took to the soil easily, and her fall leaves of gold and purplish-red were breathtaking. Spicebush is hanging on – we’ll see how she fares through the winter. The sedum did ok; it had minimal growth, but seems to be settling in. Phlox did well. I added Heuchera and a maidenhair fern in the fall. The fern was gorgeous till it died back, and the Heuchera continues to look great. A great blue lobelia sudddenly showed up one day, and it made my heart jump with joy as it nestled in next to some mosses that have moved in and created a little green heaven. I think it’s my favorite spot in the whole yard. Also of note: columbine is apparently delicious to one of the local residents. One plant got nibbled little by little until there was nothing left. The carrots took a long time to get to full size and were very strong tasting; we’ll try a different species next year. The leaves provided wonderful nourishment for the swallowtail caterpillars, and it was a joy to see them and giggle as we debated which one of us was going to have carrots for dinner. The beets did not do well. Lemon balm was prolific. I got three full harvests this year and could have had more; she was bright through mid-November. Echinacea only had two blossoms – not sure what happened. Perhaps disturbing the soil to remove the blackberry caused her some harm. We’ll see what happens in the spring. Joe-pye had a short bloom time this year and went to seed earlier than usual. Goldenrod (moved in on its own a couple years ago) was brilliant and played host to many different pollinators. The leaves did not look great, so I just harvested flowers this fall. Poke (another volunteer) did not seem to get as tall as in the past, but held many rich purple berries to entice the birds. Butterfly weed did exceptionally well and was a welcome sight as we came home each day. It’s spreading nicely, and looked great against the new yellow coneflowers. The silverleaf willow next to the front steps needs to be moved – it’s way too big for that spot now. I trimmed it way back and will attempt to transplant it in the spring. 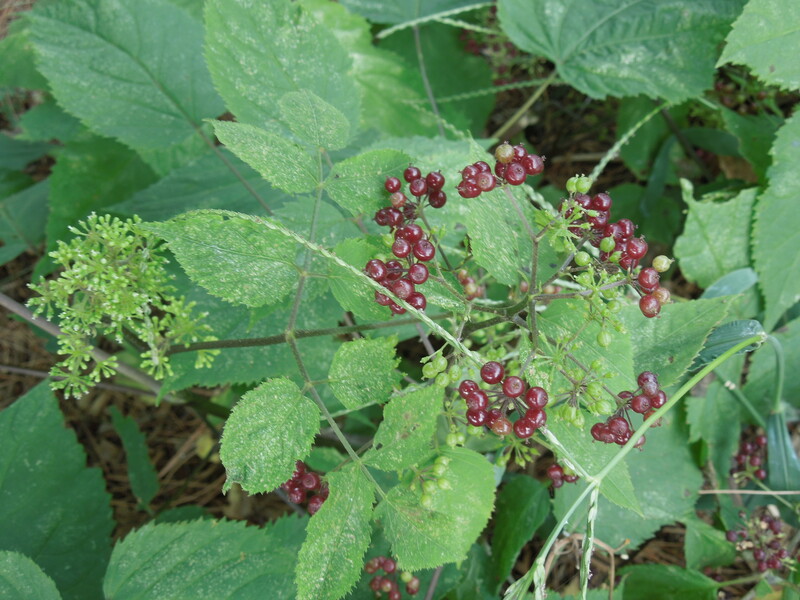 Spikenard put out deep scarlet berries this year. The birds almost ate them quicker than I could get a picture! It has been an interesting year for sure. The temperate fall and unseasonably warm December graced us with visions of dandelions, violets, daffodil greens, cherry blossoms, and forsythia blooms. It has felt and sounded more like spring than winter, and Christmas day began feeling like the tropics here because it was hot and humid! Now that the chill has moved in, who knows what our spring will look like from this topsy-turvey weather. Everyone out there seems a bit confused…animals and plants alike. One thing I learned from all this is to focus on one project at a time. I tried to do too many things at once, dispersing my attention and efforts. I need to simplify. I will scale it back a bit this year, and will forgive myself for all the mistakes I make while I’m learning. I look forward to brighter and warmer days and the chance to try again and again! So this project is now officially put to rest. What’s next? I’m not sure just yet, but I’ve got some new ideas brewing this winter. We’ll see what beautiful gifts the spring will turn up. May your days be filled with sparkling sunshine, sweet whispers on the wind, and heartfelt connection to all that this beautiful world offers. Give yourself a little time outside each day, and discover your worries melting as you breathe in nature’s goodness. Watch to see how this winter shapes up and keep your eyes open for how spring saunters in this year! This Year in the Yard project has been a labor of love, filled with interesting surprises and full of challenges on many levels. I’m a bit behind on things, so let’s get caught up! Mid-May to mid-June was gently perfumed with the scent of roses, honeysuckle, and elder flowers. Fireflies have been dazzling us with their winking lights in the darkness, bringing a little magic to our summer nights. Birds have been busy with nestlings; baby skunks, groundhogs, and squirrels have made their appearances, and the insect world is in full swing. It is the time of growth and abundance! When I started this project, I promised myself that I would share both successes and failures, so here it is…the journey of an amateur gardener trying to use her experience as a naturalist and herbalist to create a sustainable and productive yard. The more I work with the land, the more I realize how little I truly know. I’m humbled by the knowledge that I am a very small part of a very large, interconnected world. Mistakes are learning opportunities, and boy, have I been learning! As I came up for breath this week on the heels of an herb conference, herb kid’s camp, holiday weekend, new dryer, new roof, and a bunch of meetings for new projects in the community, I stared out at my veggie garden, yard, and deck. The good news is that we’ve had our fill of bountiful butter lettuce, kale, and Swiss chard! I neglected to take pictures of that abundant bed at its height of beauty, but it was a delightful sight of vitality in the yard and nourishing to our bodies. The tomatoes in the other bed that looked like they would never survive finally pulled through and are producing fruit and looking vigorous! We’re looking forward to a good tomato harvest in a few weeks if I can keep the juvenile groundhogs (affectionately named Frick and Frack) out of the RAISED BEDS WITH TANGLY NETTING AROUND IT. I’m pretty sure I scared the bejeezus out of them though. When I saw they had gotten into the bed, I ran out to chase them away. Frick got caught up in the netting trying to escape and I thought we were going to have to cut him out. I went back in to get gloves and some help, but by the time I got back out to the bed, he was gone. Whew! At this point, the lettuce/kale/chard bed has gone wild under the care. We got a little behind on the picking, so the bugs have taken up where we left off. The lettuce is no longer palatable and has gone to seed, the kale has had every last leaf munched, and the chard – well, we decided we didn’t like it that much anyway. This bed is dead. (As far as the humans are concerned, anyway). The rest of the yard has burst with life…a little too much bursting, in some cases. Stinging nettle has settled in at the edge of the driveway, reminding us to slow down and be aware of our surroundings as we load into the car (“Mind the nettles…”). My family gives me the hairy eyeball when we get into the car, and I keep telling them that I’m going to collect the seeds, because I missed the leaves when they were young enough to eat and turn into medicine. While I’ve been waiting for that one nettle plant to give up its seeds, three more have popped up and are now in flower and leaning further out into the driveway. So it’s time to get back on track and establish some boundaries. The young nettles will have to go, but I’ll create a flower essence with their tiny buds first. The rest of the weeds in the yard need to be reminded to share the space. We’re cohabitating here! I am ever-so-grateful for my hubby who donned thick gloves to remove the wild blackberry plant with its vicious canes. Some Bee Balm was lost in the battle, but the Joe-pye and Echinacea are much happier for it. I decided to refurbish the dead veggie bed and start over. I salvaged what kale I could, but all the chard and lettuce had to go. I started pulling out plants last night. As I pulled each stem from the rich soil, it felt appropriate to thank it for its life and apologize for my clumsy care. I felt like a toddler struggling with a puzzle, realizing I didn’t do something right. A little part of me grieved. I’m an amateur, and I am grateful that plants are patient and forgiving teachers. The diversity that occurred in such a short amount of time in a human-created plot gave me pause. I stopped pulling plants as the wings of a dead cabbage moth fell to the earth, feeling in awe of what had been going on all this time. Then I started to doubt what I was doing as I stared at the carnage…the wrecked habitat. I was no better than a bulldozer. I stood there confused, though I had felt sure at the beginning that starting over was the right thing to do. I knew I would make many mistakes on my journey of becoming a gardener, and this was clearly one of them. I took a deep breath, closed my eyes, and allowed myself to be still for a moment. A renewed sense of “rightness” settled in about pulling everything out and starting over. As I freed the last stem from its dirt, I watched the bare soil wiggle with life. I offered my thanks to all the creatures who were an integral part of the veggies we enjoyed and offered my condolences to those for whom this would be a death sentence. Isn’t this the cycle of life – death and rebirth? Though it’s deeply painful to experience death, it is only through death that there is space for new birth. If we kept everything and everyone we had ever loved, there would be no room for more. No room for anything new and breath-taking. No room for new life or love or friendship or jobs or space. Everything has its time and place. There is a delicate dance of life, each and every being on this planet pushing and pulling against one another. When one dies, another has the space and resources to be born and flourish. It is a continuous cycle of which we’re all a part. So I’ll continue this dance with the land, with the plants and animals as my teachers, learning to weave weeding and blogging into the routine. I will honor the losses and mistakes of the past by reflecting on those lessons and integrating them into future plans to minimize harm. I am human, and I am working my way toward becoming humane – a being who is capable of living in balance with the whole. I have a long ways to go. I hope to someday immerse myself fully into the dance so that my pushing is the perfect match for another’s pulling, with no waste of energy or resources on either end. The choice of letting go versus leaning in is present with every breath, thought, and action, and it will take a lifetime to master which way to bend and when. May your July be filled with bright beauty and bounty! Enjoy the abundance, wet your feet in the bubbling streams, and shelter yourself in the restorative shade during these hot days. There is much growth to be had yet, let’s dig in deep, shall we? Greetings all! When May arrives, I have to admit that I find it particularly challenging to keep up with all sorts of things. There’s so much spring growth and activities that I feel I can barely manage…honoring Mothers, tending gardens and yards, teaching, hubby’s work travel, festivals, supporting kids in the final throes of projects, tests, and year-end performances. DAYS. ARE. SO. FULL. Beginnings. Endings. All good things, and all in the same month. Whew! I’m finally coming up for a little air to update this blog. Thanks for your patience, and I hope you’ve been spending some time outside to enjoy the gorgeous weather of late. We’re a bit short on rain here though, so now’s a good time to invest in a rain barrel for your gardens and then do a vigorous and heartfelt rain dance! So what’s been going out there? Tons! Wood frog and American toad eggs have become tadpoles, birds of all kinds are nesting, insects are swarming, pollen is flying, trees have leafed out, and it’s beginning to feel like early summer, with multi-flora rose and honeysuckle in bloom. Being a Weed Woman, I’ve been following the progress of our local wild plants and my garden allies closely. Life is bursting! Many plants are in bloom, and it seems like things pop open or sprout up overnight. Check out our gorgeous wild kin! For the first bed, we used a total of 32 cinder blocks, which gave us a 4′ x 8′ (outside measurements) bed. We used landscaping cloth on the bottom and filled with organic soil. I wanted the second bed just a little longer, so used 36 blocks for that one. 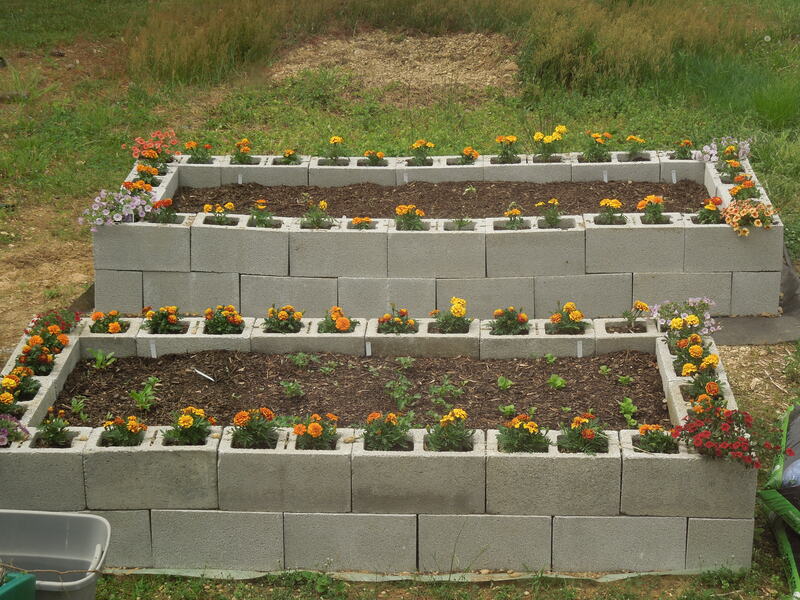 I planted marigolds in the cinder block holes to help with pests and perhaps thwart the neighborhood groundhog a bit, or at least slow her down when she sees the tender greens. The first bed is doing extremely well. I planted Swiss chard, kale, and butter lettuce from seed right into the bed. I’m looking forward to some greens in the next few weeks! The second bed is struggling a bit (in addition to having settled in to not being quite level). The tomatoes and peppers I started inside over the winter and transplanted this week are looking a little weak. I’ve been giving them plenty of water, love, and Reiki, and I’m hoping they’ll root in strongly and survive. This is all an experiment this year, as I’ve never started from seed before. I’m sure the plants will teach me what I did right and wrong! As for the rest of the yard, I made some time to collect wild violets, dandelions, and ground ivy to make flower essences and tinctures. The medicinal plants around the yard are thriving! Solomon’s seal has spread nicely over the past few years, so I’ll harvest some of the rhizomes in the fall for the first time. Echinacea, bee balm, and balloon flower (all natives) are looking healthy, and lemon balm is already in need of picking and drying (not native and quite the creeper). I’ve got a beautiful silverleaf willow (native plant I added for her looks) with tiny blue flowers that is the perfect size and looks lovely in May, but it quickly overtakes the front steps with its arching willowy branches, tickling all those brave enough to come past and into the front door. It might be time to move that clumper this year. Some blue-eyed grass made its home in a crack between the step and driveway, and for some odd reason, stinging nettle settled in at the corner of a bed and the driveway. I have no idea where it came from, but it will find its way into my medicine cabinet. I might let it go for a while and collect the seeds, as it’s growing very quickly. Butterfly weed is coming up nicely behind the nettles, and a few wild weeds snuck in that need plucking. Dandelion and plantain will become medicine, while the rest will join the compost. I mentioned early on in this project that I want to get the yard certified as a Wildlife Habitat. We have a number of components in place and plenty of wildlife already visits. I wanted to increase the diversity and improve the availability of water, so we’re building a new bed at the back of the house to add beauty and wildlife function and will add a rain barrel. The area is shady and moist, so pots full of Sedum ternatum (groundcover), wild columbine, phlox, wintergreen, Fothergilla, and spicebush are waiting to be put in this week. I’ll post pics next time when that’s complete. That’s it for now! Keep your eyes open for beautiful butterflies, mammal babies, and increasing insects (we should be seeing fireflies soon). Here’s hoping we get a little rain to moisten the soil and cool things off! Bright greetings! It’s been a beautiful week with welcome sunshine and a few April showers! Life is returning to the land….forsythia and magnolias are bursting with color and American toads are trilling and mating in the marsh. 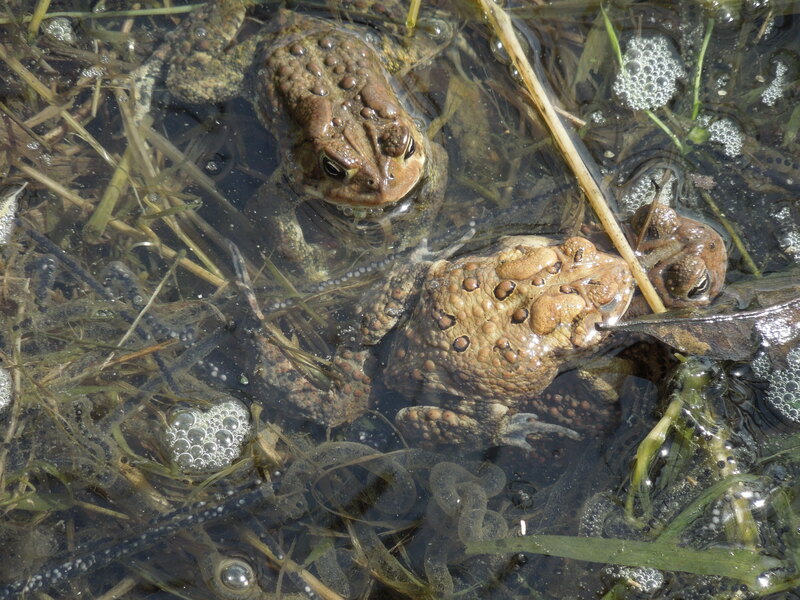 Large female (right side of photo) is laying a long strand of eggs behind her while the male on top holds her in amplexus and fertilizes the eggs. Another male waits nearby at the top of the photo. and buzzing bees are visiting the early flowers. 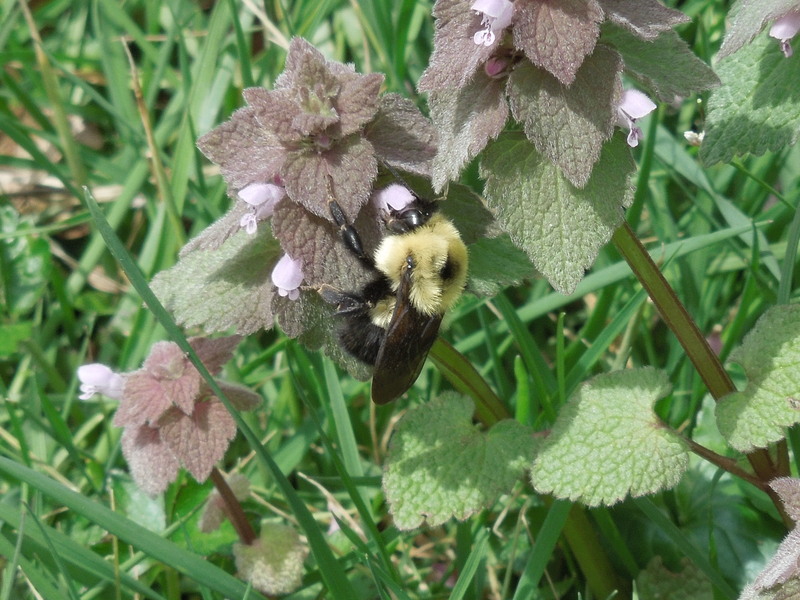 Purple deadnettle is enticing bumblebees with an intoxicating scent, and the leaves and flowers make a delicious (if a little fuzzy) addition to spring salads for us humans. I was happy to see them blossom in my yard this week, along with dandelions and violets! Back in my yard, Echinacea and lemon balm are looking vigorous, bee balm has broken through the soil, balloon flower just made an appearance two days ago, and tulips are getting ready to bloom this week. Wild and welcome weedy migrants include ground ivy, speedwell, plantain, mouse-eared chickweed, dandelion, violets, sorrel, mock strawberry, and one random small patch of nettles next to my driveway (I have no explanation for this one). I also have way more Poke (coming up in front of the tulips) than I could ever use. Anybody herbalists out there need some poke root? C’mon over! Please. There’s nothing like being outside in soothing sunshine and among beautiful plants to lift your spirits! If you want to add new color and texture to your yard with plants that are easy to grow, low maintenance, good for your yard, and attract butterflies and birds…mark you calender for the Native Plant Sale at Coverdale Farm on May 2-3. Click here for more info and an online catalog. If you stop by on Saturday morning 5/2, I’ll be helping out – feel free to ask me about native medicinal plants or plants that will bring beautiful wildlife to your yard. There are some nice options available this year. Gateway Garden Center in Hockessin also carries some lovely native plants. Ask your your local nursery what natives they stock! May the coming week bring sweet sunshine, fresh breezes, and brilliant color to brighten your days. Ahhh…finally, spring weather and color! We’re still dealing with some chilly temps and windy days, but all the signs are there to let us know the growing season is upon us. Lawns are greening, redbuds are donning their magenta blossoms, forsythias are starting to burst with yellow at the tips, and dogwoods and magnolias have finally loosened their grip on their buds. Wildlife is busy indulging in spring habits too. Male birds are showing off in territorial displays and tree swallows are competing for nest boxes. Groundhog mamas are filling their bellies with greens and gathering grasses to line their burrows in preparation for spring babies, while wood frogs, spring peepers, and American toads have been visiting local marshes and ponds to mate and leave their precious eggs to continue the cycle of rebirth. That’s it for today! It’s time to get back outside and celebrate the sun and new life. May your coming week be filled with brilliant color, bright sunshine, and joy to warm your heart! Mid-March Greetings! It’s been a couple wild weeks around here. I’ve been anxiously anticipating the arrival of spring, feeling like an arrow nocked in the bow and ready to be released, but held in that tense position as yet another winter storm blew our way. We had a heavy snow last week that started icy, morphed to wet, then finished off as light and fluffy. Though unwanted, no one could deny it’s beauty. The snow layered on everything in fascinating textures and patterns, lending an artistic flair to the landscape. 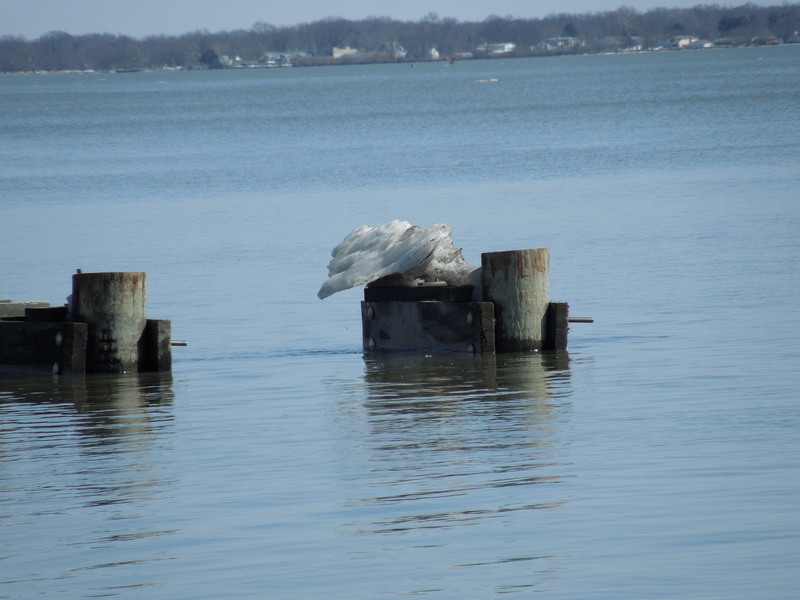 Shortly after that snowfall, temperatures rose and the melt began. Water rushed downhill towards streams and was left pooling on the roads. Potholes the size of craters have made themselves evident, leaving the highways an obstacle course to navigate. Streams are swollen, low-lying areas are minefields of puddles and mud, and color is returning to the land. Crocuses and hyacinths have appeared and trees buds are about ready to burst open. Before we know it, wood frogs and spring peepers will fill the air with their chorus. Allergy season is now upon us and the days seem a little longer and brighter thanks to Daylight Savings Time (though I hate feeling jet-lagged without a great vacation to show for it). The northern hemisphere is waking from her slumber, with spring peeking out from under winter’s blanket. It was a good week to get out and about with the warmer temperatures and sunny days. 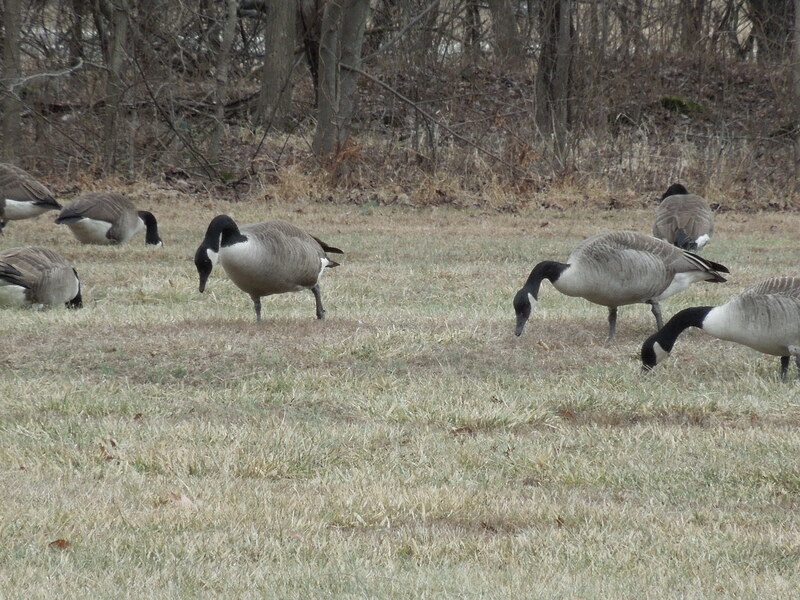 Here are some shots from around the Delaware River and C&D Canal. I almost missed the muskrat shot – we were both startled at our close proximity! My yard is donning her spring skirt of purple deadnettle and ground ivy, so violets and dandelions can’t be far behind to add to the finery. There are still a few seeds hanging on last year’s bee balm, Echinacea, and Joe-pye weed, so I’ll wait a little longer before I trim everything back so that migrating birds have some sustenance on their journey north. We’re bound to see a lot happening in the next few weeks, so keep your eyes and ears open. Sprouts and blossoms are imminent, mammal babies will soon be making their appearance, insects will be buzzing, and birds will be nesting. The spring serenade has begun and there’s a freshness in the air to relieve us of the stagnation of winter. Let us fill our eyes and hearts with the brightening days and welcome in the time of freshness and rebirth. May the coming week bring lightness to your heart and mind as we stretch into spring. March madness is upon us, and I’m not talking about any kind of sports-ball. Geese are sailing through the skies in large numbers, announcing their return loudly and proudly, pausing to forage in open fields. Robins are flocking to the last of the winter berries and searching for worms under snow melt, while blackbirds fill the trees with their raucous chorus. Icicles gain length daily as they thaw and re-freeze, and creeks are cracking their frozen blankets. Spring is sneaking in, despite continued temperatures below freezing. When 35 degrees feels warm to me and I open windows to air out the house, I know I’m starting to go a little mad myself, itching to move free and cast off my winter coat. My yard is still covered in snow, but I can see ground ivy and Indian strawberry peeking through in a few places. Sap is rising, there are buds on trees and shrubs, and the promise of spring is in the air, carried on the birds’ sweet songs. Mammals are mating, and all kinds of things are going on underground in preparation for the active season. 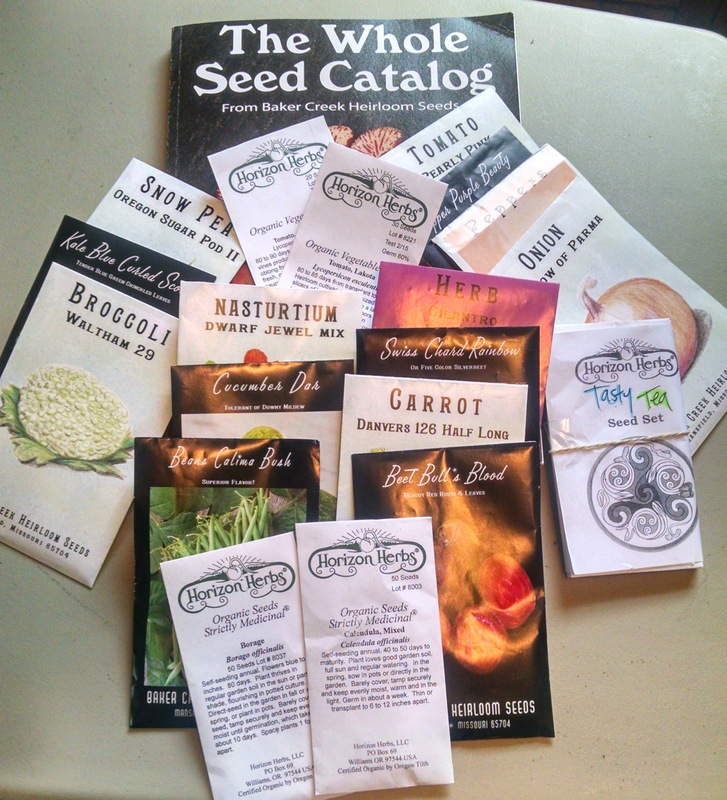 In my desperation for growing greens, on Friday I went through the seed packets I ordered and determined which ones I could start. In the past, I grew tomatoes and peppers in containers from young plants. This year, I got the urge to dive into a bigger garden and start from scratch. My daughter and I drooled over the Whole Seed Catalog from Baker Creek Heirloom Seeds, our eyes filled with glorious photos of colorful peppers and vibrant greens. We were hungry for vitality, and with highlighters in hand, marked everything we wanted to try – way more than we could possibly grow this first year. I pared down the list, placed my order, and the seeds came quickly. Then I popped over to Horizon Herbs for some medicinal herb seeds. 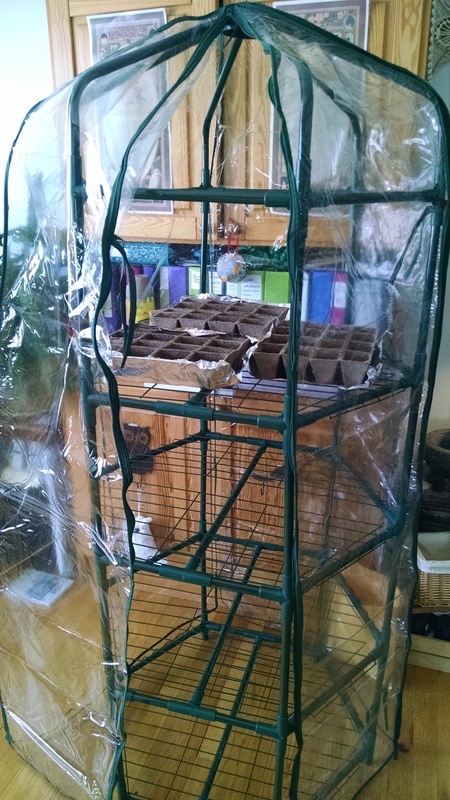 I bought a small greenhouse for indoor/outdoor use, as I have a curious cat who likes to nibble small green shoots and needed vertical space for starting seeds. The greenhouse was easy to set up and I’m happy with it so far. I’m sure this gardening adventure will be filled with lots of “learning opportunities”, and I hopefully anticipate the birth of sprouts in the next couple weeks, with more planting to follow as we get closer to that frost-free date. Though we may sit in the bonds of a winter storm today, I hold out hope as the forecast includes climbing temperatures this week. It looks to be pretty wet with rain and snow melt, so consider your footwear carefully. Winter is starting to get weary. She will soon give up her snowy mantle to the carpets of green, yellow, and purple. If we are quiet, we can hear Spring’s song whispering in the wind…she’s blowing in…and with it, movement and growth that will gain momentum as we roll through March and into April. Breathe deep, nourish your dreams, and be kind to your body, mind, and spirit as we move through this time of transition. Humans have always watched nature for signs of weather and seasonal changes, as well as disturbances to the normal pattern of things. Though we may find Groundhog Day predictions disappointing or consider groundhogs to be pests, they really do have an important place in the food chain, and their burrows provide lots of other species with homes. National Wildlife Federation has some great info on groundhogs, also known as woodchucks, and the origin of Groundhog Day here. So what’s going on out there? We’ve just passed mid-winter and the longer daylight has probably taken your notice. There are spring bird songs on the wind, great horned owls are nesting, and blackbirds are murmuring their way back to the area and emptying out bird feeders in record time. I haven’t seen any groundhogs appearing from their burrows in my neighborhood yet, though. Snowdrops continue to bloom, crocuses are popping out, and although I didn’t get to check the wetlands last week, I’d bet there are some of these little beauties peeking out. This exotic flower looks like it belongs in a tropical jungle, but it’s a local native – skunk cabbage. It will get its large cabbage-like green leaves as the season progresses. Skunk cabbage (Symplocarpus foetidus) gets its name from the smell that permeates the air when you crush the leaves. Although the smell is unpleasant, the root provides a potent (small-dose) medicine for spasmodic lung conditions and was used by the Native Americans as cough medicine. The leaves were also made into a poultice (crushed up and placed on the area needed) for pain relief. The evenings over the past week have been stunning, though brisk. Last Tuesday night, the full moon cast a brilliant glow on the earth below, lending clarity of form to what normally appears as dark shapes. Crystallized grasses became an enchanted pathway, shimmering in the soft moonlight. 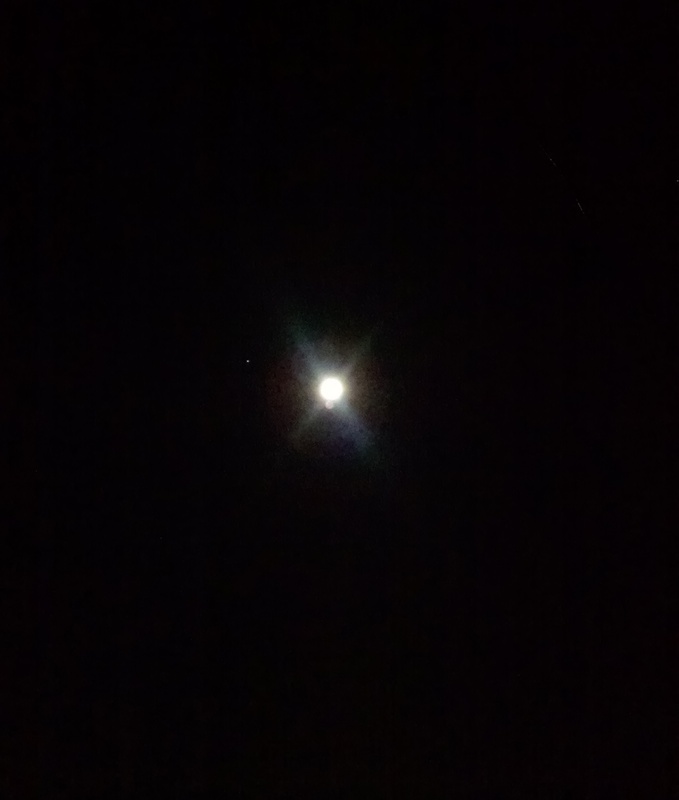 Winter constellations were clear and bright, and the air was crisp and refreshing. It was the epitome of winter’s beauty, with a silence that curled around everything in a cape of peace and solace. The month of February has a bit of anticipation and mystery to it. We get teased with some signs of spring, yet the frosty nights remind us we are still in the grip of winter. It’s an in-between time, as we walk a line of light and dark, cool and warm, winter bareness and spring songs. It’s also the time of owls. On an owl hike Saturday night, we were graced by some Eastern screech owls, alerting us to their presence in the area with their trilling calls. Two of them flew in above our heads, and we only knew they were there because we looked for their silhouettes against the sky. Owls’ specialized feathers are frayed at the ends to allow them to fly in silence, making them skillful nocturnal predators. If we hadn’t seen them fly in, we wouldn’t have known they landed right above us. 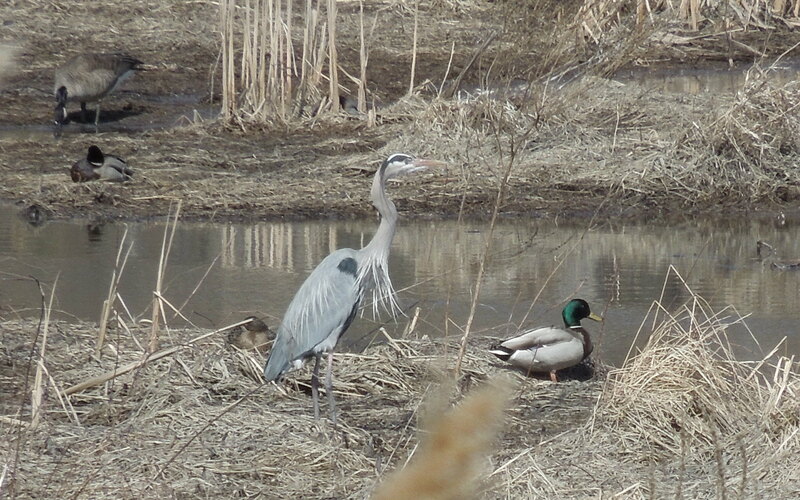 For more info and pictures of these local wonders, check out Cornell University’s All About Birds website. Until next time, enjoy the February gifts of biting-chill-that-makes-you-feel-alive and thank-goodness-there’s-warm-sunshine-to-bask-in days! Greetings one and all! I don’t know how everyone else is doing, but I’ve been feeling a bit sun-starved over the past 2 weeks. There’s been rain, snow, and a lot of clouds lately. I’ve found myself pining for warmer, brighter days and making blends of lemon balm, linden, tulsi, and St. Johns wort tea to help shake my grey mood. I feel like a seedling, stuck under ground in the dark, yearning for the time to break through. But Mother Nature always has a little magic up her sleeve, and just when you think you can’t stand it any more, the sun returns for a brief visit. This past Friday dawned with vivid rays of light, so I decided to head outside with camera in hand to soak up the warmth and see who else was out and about. I had planned to visit a local park, but ended up taking what I call an “adventure ride”, where you just get in the car and drive where you feel like you want to go. You never know what’s gonna happen on an adventure ride. I drove down to MD route 213 towards Chesapeake City, over the C&D canal bridge, and found that the day was shaping up to be a little hint of spring. The car was warm and comfortable, and it was such a freeing feeling to be driving along the back roads, past open farmland where geese were grazing and the sky was clear. One of my favorite things about winter is that it’s easy to spot raptors and other birds through the bare trees, especially red-tailed hawks who are often found perching along the side of the road. Since the day was sunny, I was hoping our feathered friends would be active. I was not disappointed…I saw 12-15 raptors in my travels! I ended up in Middletown, where a couple of Cooper’s hawks passed over the road, heading towards a field on my left. There were copious small birds around the area, as well as a hawk sitting on a wire, but I stopped looking at him when I caught a flash of white in the sky. 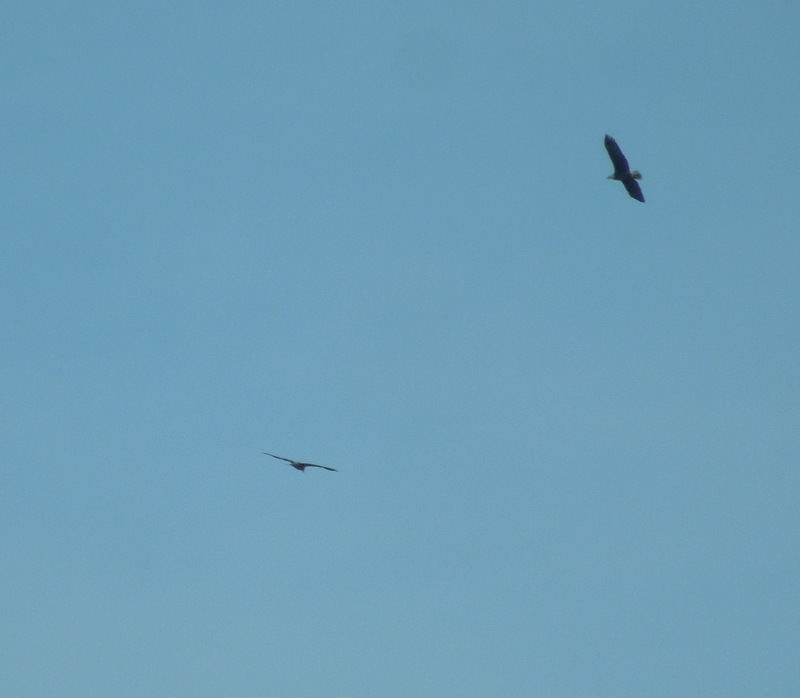 I looked up and there were two bald eagles soaring on the thermal currents. I pulled over on the shoulder and watched them for a few minutes until they soared out of sight. What a treat! I continued up 896 and decided to head toward Delaware City. This is not a drive I particularly enjoy because of all the refineries in the area, but it felt like the way to go. As I drove along, I was surprised to see a deer on my left, nibbling on some grasses behind a fence, just a few yards from the road, and there were about 50 geese milling around an open area to my right, enjoying the leftovers of a fallow farm field. Slowly, I came into town and turned toward Fort Delaware, taking notice of the historic houses and the unique shops. I was anxious to see what was happening on the riverfront. I parked the car and decided I was comfortable enough in my sweatshirt (almost 40 degrees with no wind) to look out over the water. I stood directly across from Pea Patch Island, which hosts Fort Delaware, a Civil War fortress and part of the state park system. Pea Patch Island is also one of the largest heron nesting areas on the east coast, and is must-see spot in the warmer months. (More info can be found here). My eyes were drawn to some mallard duck pairs darting in and out of the phragmites, moving to maintain their camouflage in direct response to my movement as I tried to photograph them. We danced back and forth until I finally held still to just enjoy their presence and be in the moment. I stood in silence…watching seagulls, listening to the sounds of the water lapping against the rocks, and soaking up the sun, drawing its warmth into my center. I said goodbye to the ducks, returned to my car, and pulled out of the parking space. As I headed for the exit, sudden white movement against the clear sky caught my attention. I quickly pulled back into the space, leapt out of the car with camera in tow and gazed skyward, tracking a bald eagle soaring directly overhead. Now, here’s where it gets a bit interesting. Remember when I said you never know what’s going to happen on an adventure ride? Well, I’ve decided that you should really bring a buddy along with you when you go wildlife watching. Because at no point in time is it a good idea to leap excitedly out of the car with your camera in hand unless you have first put the car in park, or, you are the passenger. From the corner of my eye, I watched my car slowly roll away from me, luckily towards the curb, since I had not pulled all the way in to the parking space. I quickly jumped back in and secured it properly, scolding myself, then resumed my pursuit outside the car. I couldn’t believe that I had seen three eagles in one day! 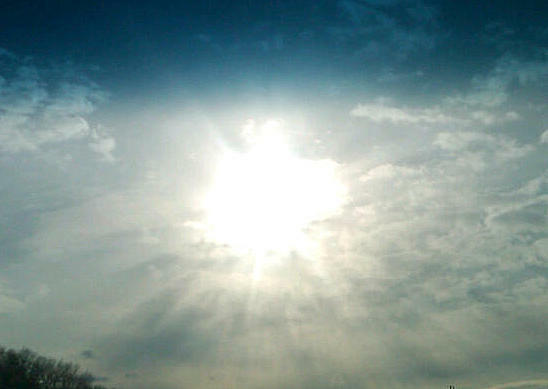 As he soared away, I smiled, grateful for the day’s experience. The door is wide open, my valuables are sitting in plain view on the front seat, and the keys are in the ignition with the car still running. I am 15 feet away from it. Yet, the car is still there with everything in it. GOOD GRIEF. Word to the wise: Take a buddy with you wildlife watching to keep you sane and safe. Ok, that’s enough excitement for now. Maybe next time I’ll focus more on plants – you don’t have to chase them and I’ll probably remember to finish parking the car and be more attentive upon my exit from it. All content and images are subject to copyright laws and the sole property of earthgrl, Sue Bara. All rights reserved.